You certainly are here because you also want to know how you may do a fast motion effect on your lengthy and boring video. A fast motion video editor can help you with that. You may turn a 15- minute video into 2 or 3-minute one. Fast motion effects are often used when some actions in videos are done with longer time. Perhaps, in a recorded dinner party, you won’t watch visitors start and finish eating. Instead, you would need to fast it forward and proceed with the other important happenings in the party. The good thing about this effect is that you won’t be able to miss a moment unlike if you cut it. Thus, you or the other viewers could still watch the full video. To help you with your problem, below are three of the best tools which you may use to achieve a fast motion effect on a video. Video Grabber is a web-based video downloading app with other helpful functions such as file converting and editing. With this free online app, you can create a fast motion video by using its editing function. 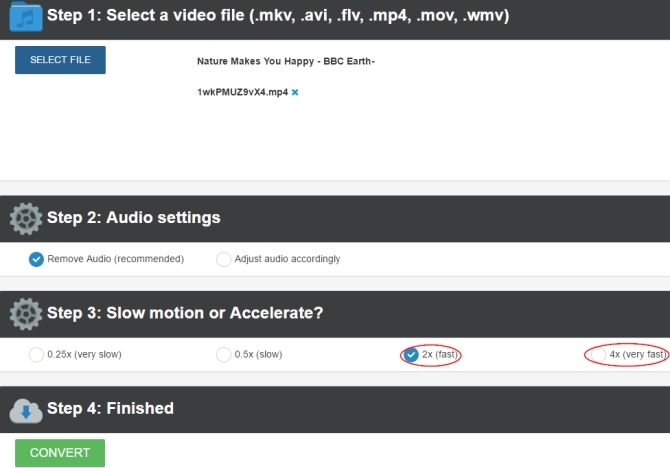 All you need to do is to visit Video Grabber and then click on “Convert Video” and “Select files to Convert”. Add the video that you want to edit and once it is already uploaded in the interface, click the pencil icon on the right part of the tool to enter its editing options. A new window will then pop-out. Browse down and then choose its “Play Speed”. You may then decide how fast you want the video will be. You can adjust it up to 400% faster. Once done, just simply click on “OK” and “Convert” to save the video file on your computer. Apart from that, this fast motion video software, can also let you add some effects, adjust the video volume, crop and rotate the video if you wish to. You may also change its resolution, bitrate and frame rate in accordance to your preferences. Another online application which you can use to make a video in fast motion is the MP3Care app. Just like Video Grabber, this is also a free app and requires an internet connection to work. However, this one is solely made to offer you a service of making a video in slow or fast motion. You may also remove the audio of your video or if you wish to, the app will also adjust the audio for you. It supports files in MOV, MP4, WMV, MKV and FLV format. If you are looking for a more professional desktop tool which you could use to make fast motion video, then ApowerEdit is a perfect fit. This tool lets you make advanced editing on a video. You can add text, filters, overlays and transitions with it. Furthermore, you may also crop, split, and adjust the video’s brightness, saturation, contrast, and speed. 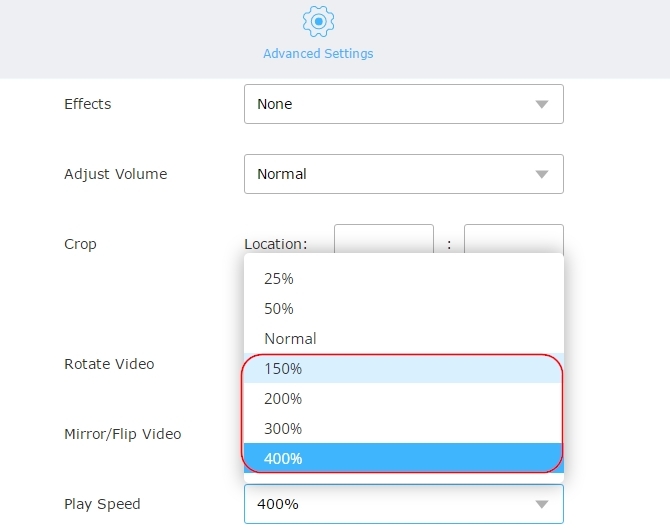 By adjusting the speed of the video, you’ll be able to make it slower or faster by 5 times the original speed. See the steps below for the detailed guide on how you may use it. Click the “Import” button to add the file that you want to edit on the interface of the tool. After uploading the file, drag it in the timeline and right click it. Choose on “Edit” and a new window will appear. Edit its speed according on how fast you want it to be and then click “OK”. Export it by clicking “Export” to save the file on the computer. This fast motion video maker obviously has everything you need in a video editor. 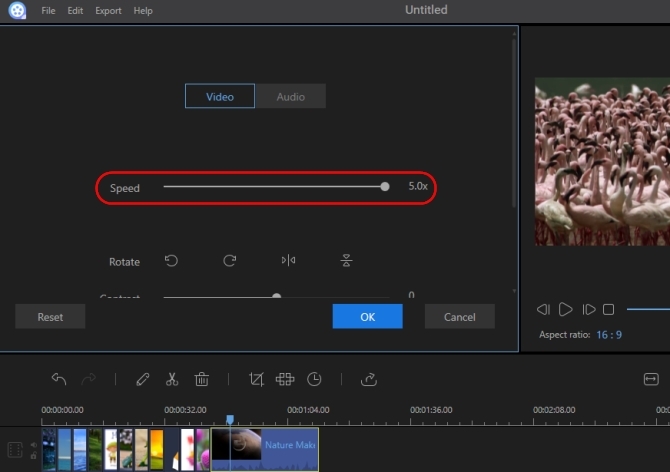 You can adjust the speed of the video and at the same time make some other editing which can help in enhancing your video. If you look at the three tools closely, you’ll definitely notice that all of them are very much helpful in making a fast motion video. However, if you are into practicality, then ApowerEdit is definitely the best. You can use it even if you don’t have an internet connection. Furthermore, its editing function is really great that the other two online apps do not have.